Take advantage of our Money Mailer Spring Specials for a limited time only! Call our office at 302-616-2906 and ask for our Money Mailer Spring Specials! Get a NEW 14 SEER Heating and Air conditioning system for as low as $6,000! That’s up to 4 tons of American Standard heating and cooling equipment! Financing available for qualifying applicants! Get 10% off your first service call up to $1,000! 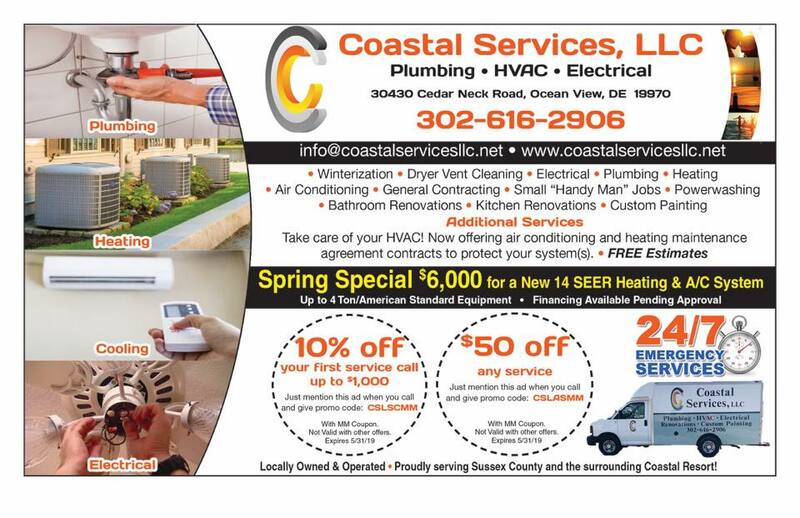 Just mention this ad or give the promo code CSLSCMM for 10% off your first service call with Coastal Services this spring. Some restrictions may apply. Offer expires 5/31/19. Not valid in combination with other offers. $50 OFF ANY SERVICE! Just mention this ad or give the promo code CSLASMM when you call to book any service with Coastal Services this spring! Some restrictions may apply. Offer expires 5/31/19. Not valid in combination with other offers. Coastal Services should be your choice for plumbing, heating, cooling, and electrical services! Call us any time day or night to take advantage of our exclusive 24/7 Emergency Services guarantee! Just call 302-616-2906 to ask about our services today! Locally-owned and operated right in Sussex County, Delaware! We’re located in Ocean View, Delaware serving the Coastal Resort area of Delaware. Call the professionals at Coastal Services LLC today! Don’t wait until we’re booked for the summer. Get your service scheduled today.